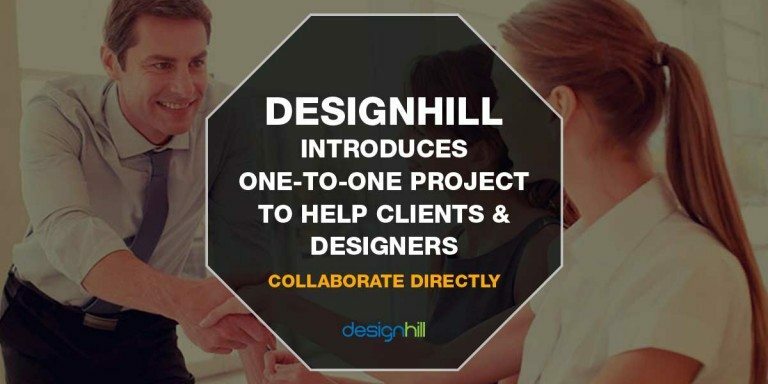 One of the heavyweights in the design crowdsourcing industry, Designhill.com launched it’s most awaited program – the ‘One-to-One Project’. The project is a one-of-its kind feature that will provide an opportunity to the clients be it businesses, agencies, marketers and individual design seekers to choose a designer and work directly with him. The clients can negotiate project budget, manage projects and improve work flow with the designers on a one to one basis. “One-to-One Project will enable clients invite freelance graphic designers they want to work with, negotiate and finalize terms of the project, provide feedback and source creative and unique designs. The designs they have always been looking for,” said Designhill co-founder Rahul Aggarwal. For more and updated details about Designhill ‘One-to-One Project’. Through this project, a client can thrive into the network of more than 29,500 graphic designers from across the globe. Work with Professional Designers – The community of designers is pretty talented and trusted as the Designhill team especially handpicks and curates the designers. Wide Range of Choice & Payments – You get to select the designer of your choice from over 29,500 designers. Also, you can talk negotiate and talk about payment of your project directly with the designers. Security of Money – Payments remain secure with Designhill until the end of the project. Complete Control -You can see the entire work progress, review designs and send designers feedback accordingly. 24X7 Support – Designhill provides all its customer 24×7 support which is free of cost and will help you get the best out of the entire process. Complete Designer Focus – Designers will show full confidence and will be completely focused on their work as their payments are securely deposited with Designhill. Clients can start by reviewing the design gallery and directly invite the designer of their choice to participate in the project. When they review a design in the gallery, they will get to see options to send direct invite to the designer who has created the design. Get started with your one-to-one project and start discovering talented designers. ‘One-to-One Project’ promises umpteen benefits to freelance graphic designers too. They can chat directly with clients, finalize a price for their graphic design jobs and earn money in a safe and secure manner. Let’s check out some benefits of ‘One-to-One Project’ for designers. Global Exposure – Designers get the chance to showcase their work to businesses and clients from around the world. Multiple Projects –Designers can get hired for multiple projects with multiple clients at the same time while managing everything from one place. Project Control – They get to negotiate and finalize their fees directly with the clients. Long-term Relationships – They get to work with clients not just once, but over years without worrying about any communication or payment issues. Hassle-free Communication – Designers can see the entire work progress, submit your designs and review feedback from clients without the hassle of sending dozens of emails. The Designhill team and it’s designer community is quite coordinated which further ensures 100% satisfaction to the clients. Designers without an account must register and create a portfolio to become eligible for ‘One-to-One Project’. Remember, graphic designers with best portfolios will stand better chances to getting invites from clients to participate. Create your free portfolio to get hired by clients to participate in one-to-one project and earn big.